Karen Ogen- i Teach With Technology: Poster My Wall! I am LOVING PosterMyWall! I have to thank my colleague Jennifer Morrison for sharing this great resource on our Discovery Education Edmodo site because it is a real find. 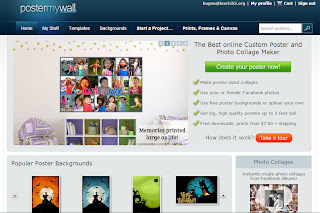 PosterMyWall is an online site that will allow you or your students to instantly and FREELY create wonderful quality posters. You can use the pre-loaded backgrounds and clipart or upload your own. Plus you can upload your own images and the program comes with some awesome fonts and font effects. As a teacher I often find many occasions to create posters. But, think of all the reasons that you can also have students create posters in the classroom. Posters are wonderful projects for end of unit reports for students to show what they know; and they can be used for any subject area. This tool is extremely easy to use. Teachers can also upgrade their account to a FREE teacher account after signing up for the initial account. Just go to: http://www.postermywall.com/index.php/edu and upgrade your account. Then your students can save their work without any need to have an account of their own. The only negatives are publishing and saving options. The posters do not reside online. Finished projects can be downloaded and and printed or added to other documents such as MS Word. Or, projects can be published to social media sites such as Facebook or Pinterest. Regardless, this is a great site for creating posters for you and your students!